The Swan was originally designed by Bohus Stickning / Karin Ivarsson in 1966 and was recreated by Solveig Gustafsson in 2011. 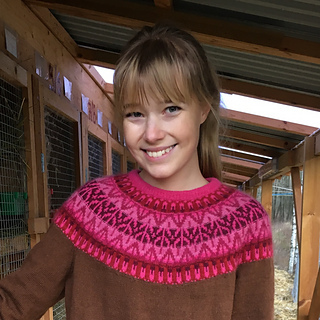 The Red Swan was recreated by Pernille Silfverberg and Solveig Gustafsson in 2018. To recreate the Red Swan original charts were closely studied and vintage garments carefully examined in museums and private collections to make sure that the resulting patterns and yarns would match the original Bohus Stickning garments as closely as possible. There is a family of Bohus Swan patterns…big and little Swan, Green Swan, etc.